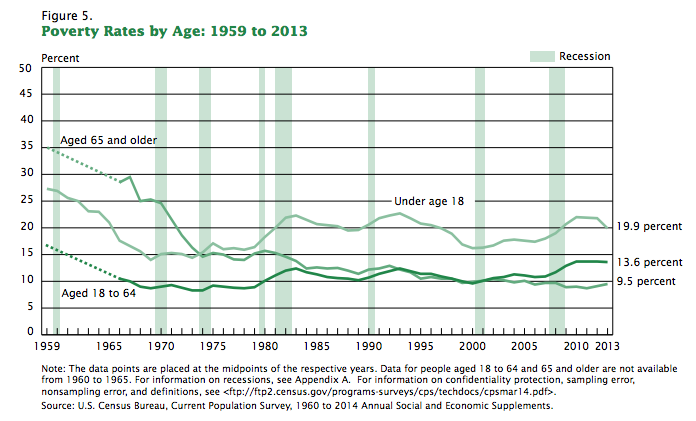 Child poverty decline: American rate goes down. The poverty rate for children fell nearly 2 full percentage points last year, from 21.8 percent to 19.9 percent, according to the US Census Bureau. The poverty rate for all Americans also declined, to 14.5 percent from 15 percent a year before. The overall poverty rate is still higher than it was in 2007, and 45 million Americans are under the poverty line. You can find guidelines for determining the rate here; for a married couple with two children under 18, for example, the “poverty threshold” for annual income is $23,624.